Heavy rain pounded India’s commercial capital Mumbai on Tuesday. 26/7 was repeated yet again!! 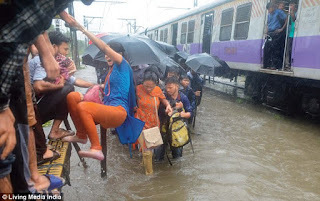 Heavy rains continue to lash Mumbai leading to waist deep water logging in several areas of city, slowing down traffic movement and delaying flights and the lifeline of Mumbai was totally shut down leaving thousands stranded. All three harbour, central and western railway lines were shut down. Lower Parel, Dadar, Sion and many other stations were flooded with water on the tracks which shut down the trains and signal failure. 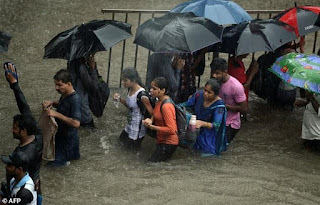 On Tuesday, the Santacruz weather station, representative of the suburbs and rest of Mumbai, recorded 331.4 mm rain, categorised as ‘extremely heavy’. 15 deaths have been reported as of Wednesday in Maharashtra. Despite this bad rains Mumbai spirit was not slowed down. Navy community kitchens were providing food at Churchgate, Byculla, Parel, CST, Worli, Tardeo, Mumbai Central, Dadar, Mankhurd, Chembur, Malad and Ghatkopar. Many tea vendors offered free tea and biscuits. Hotels all over offered to sit free in there lounges and sitting area. Even offices where open for all the staff to stay back the whole night with food. But i just feel sad for such sickness showed by Ola and Uber people, they charged triple the fares. Where people all over offered free food and services mcdonalds people charged triple the amount. Four persons were washed away in separate incidents in Mumbai since Tuesday, said PTI quoting police. The incidents were reported from Dahisar, Kandivli, Malad and Dadar. Dr. Deepak Amarapurkar aged 59 years old a renowed gastroenterologist died after falling into an open manhole just minutes from his home. His umbrella was found just beside the manhole. Many tress fell down due to very windy weather and damaging many cars and some people also. Many injured were shifted to Saifee and nearby hospitals. 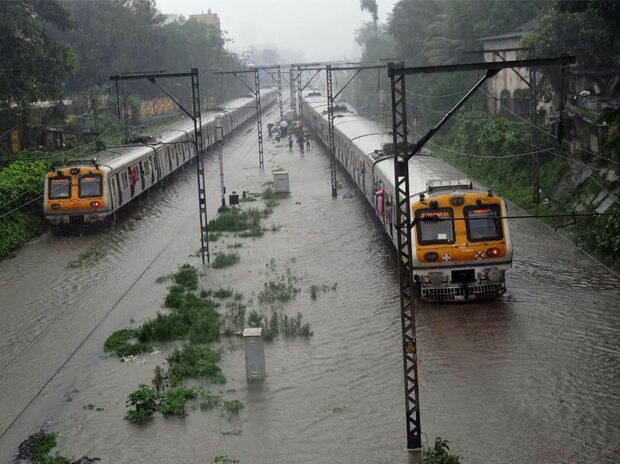 3 teams of NDRF stationed in Mumbai put on alert and two additional teams have been moved from Pune to Mumbai. 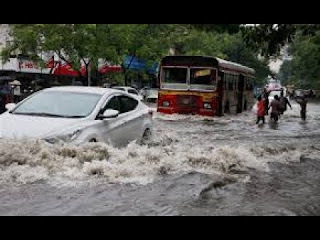 As usual while the officials from the Brihanmumbai Municipal Corporation (BMC) said that they have received only two complaints of water logging at Sion and Andheri subway, citizens complained of water logging in areas like Sion, Matunga, parts of Dadar, Hindmata, Bkc, Wadala, Ghatkopar, Andheri and Mulund. Autos, taxi and buses were left flooded in the water. Due to heavy rains roads were blocked eastern and western highways was pack jam with traffic. 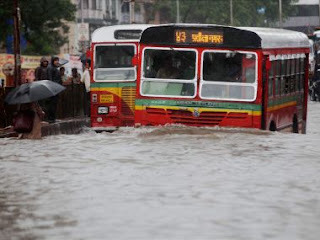 Despite of all false promises made by Bmc that this year we wont face any water logging the Bmc as usual failed badly. Mumbai was totally shut down by road and rail. People had to suffered a lot especially the women. Hope so in the coming years Bmc does some work seriously and we should be prepared for such rains in the future.